Combine all ingredients for the Maple BBQ Sauce in a medium saucepan and bring to a simmer over medium heat. Whisk to combine, reduce heat slightly, and simmer for 10-15 minutes until the sauce thickens. Allow to cool completely, then transfer to an airtight container and store in the refrigerator until ready for use. Heat grill to medium-high heat. Thread chicken breast, bell peppers, zucchini, tomato, and onion onto 4-8 long bamboo skewers. Brush ~1/4 cup Maple BBQ Sauce onto the kabobs to lightly coat. 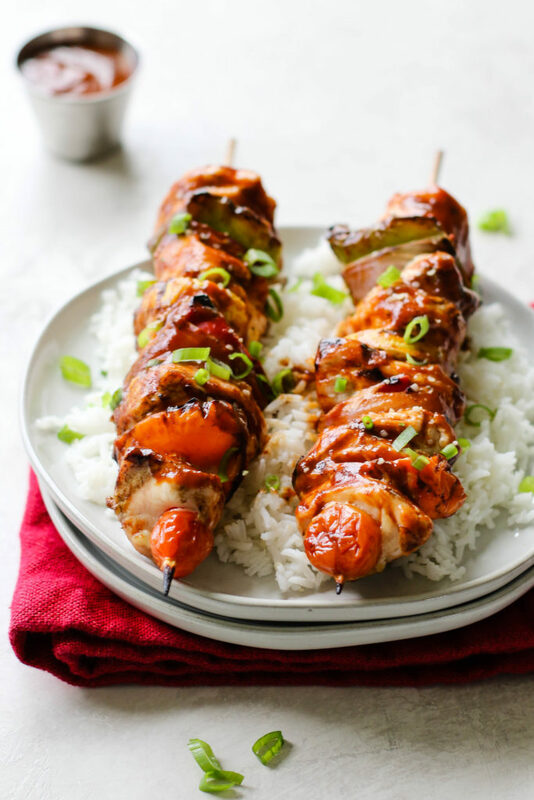 Place kabobs on the grill for 10-12 minutes, turning and brushing occasionally with more Maple BBQ Sauce. Serve immediately alone or with jasmine rice. Garnish with green onion and hemp hearts.